Beets Baby Food Recipes – When can baby eat beets and how to prepare beets for your baby. Learn about beets and try some beets baby food recipe ideas too. Beets are very nutritious for your little one. A great color to engage your little one’s eyes and pinching fingers, serve up some beets to your little one as a great finger food. Beets contain a wonderful amount of calcium, potassium and even vitamin A. Both Vitamin A and Calcium play a large role in the healthy development of your baby. It’s hard to believe how high in fiber beets are; just 2 medium sized beets contain 2 grams of fiber! As noted above, many pediatricians suggest introducing beets between 8-10 months of age. As always, we recommend that you thoroughly discuss any feeding issues with your pediatrician as generalities may not apply to your child. According to the EWG, beets are not one of the “dirty dozen” foods that are most highly contaminated with pesticides – purchasing organic is a personal choice. When selecting beets for homemade baby food, try to purchase fresh beets whenever possible. The medium sized beets are more tender and tasty than the large beets. Many recommend completely bypassing beets if they are over 3-4 inches in diameter. With beets, bigger is not better. Choose unbruised or otherwise unblemished beets. Beets come in all types of colors including red, yellow and of course, that well known purple color. When possible, buy beets that still have their green leafy tops attached as as they will remain more fresh. Don’t look at the dirt on beets as a negative, seldom will you find nicely washed and shiny beets in your grocery store. To store beets, cut off the greens and then place in an airtight container or a freezer bag and put them in the “veggie crisper” or the far back of your refrigerator. Beets will remain fresh for about 1 week as long as they are kept cold. When preparing Beets, I like to roast or steam them. Steaming is really the very best method for cooking and preparing them if you want to use them for baby food. They will cook up a bit more mushy and more easy to puree when steamed. Steaming Beets also allows the Vitamin A beta carotene to be more bio-available and readily used by the body. Beets should be peeled and the greens cut off when making baby food purées. Even adults should not eat the peel of beets as they are not easily digestible. We have found that more often than not, the recommendation for introducing Beets is between 8-10 months old. Again, please see our Nitrates article for more in-depth information. Step 2: Place chunks into a steamer pan with just enough water visible through the steamer basket. You may also boil them in a scant amount of water if you prefer. Step 5: Place into your choice of appliance for pureeing and begin pureeing. We find a food processor works best to make a really nice textured beet puree. Step 1: Mix beets and potatoes together and serve. Step 2: Add a 1/2 cup soft cooked diced carrots for extra eye appeal. Step 1: Combine the beets, rice, onion, and chicken or turkey in a bowl and stir to mix well. Step 3: Wipe a 2-quart casserole dish with nonstick cooking spray or olive oil, and spread the mixture evenly in a dish. Step 4: Bake at 350 degrees for 50 minutes to 1 hour, or until a sharp knife inserted in the center of the dish comes out clean. Remove dish from oven and let sit for 5 minutes before serving. + This dish was created when I could not find anything to do with the leftover chicken, near-ready to be tossed beets and extra brown rice. 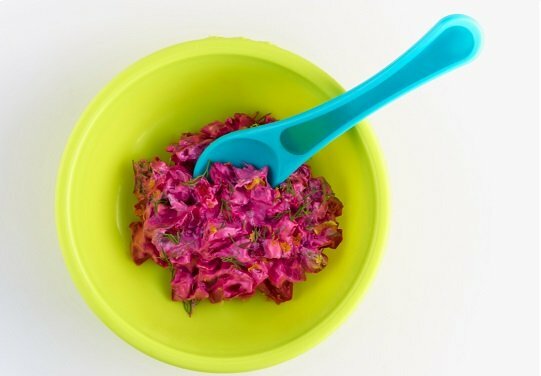 A nice way to get some color and beets into your baby or toddler. Step 1: Thoroughly cleanse and then peel the beets. Cut the beets into thin slices. Step 2: Using small cookie cutters, cut out shapes from the beet slices. You may have to press really hard to do this. Step 3: Transfer shapes onto a oiled baking sheet and brush the beets lightly with olive oil. Step 4: Bake at 350 for approx. 10-20 minutes or until the beets are soft and tender. You may wish to cover the baking sheet with a strip of tinfoil. You may also try to steam the beet shapes. I have never had luck with steaming beet shapes though I do believe that a thicker beet shape might steam well. Serve as fun finger foods or simply mash and serve. Step 1: Peel skin off of the turnip then cut turnip into pieces… size doesn’t matter, but the smaller you cut them the faster they will boil. Step 2:Place the turnip in saucepan with just enough water to cover then boil until fork tender. Step 3: Clean and peel then cut up the Beets and steam until tender – or steam Turnips and Beets together. When Turnip & Beets are ready, put both in one bowl or saucepan and mash them together. Or you can mash them separately (food processor can also be used) and then mix them together. Add spices as desired. Tofu – beets turn tofu a wonderful purple color. After eating beets, your baby may have poop that is a pink to reddish color so don’t be alarmed. Blood in poop is seen as red streaks throughout the stool but the whole stool is not colored red.